Get your copy of Kundalini Awakening: 5 in 1 Bundle today! This audio book enlightens me with the benefits and power of kundalini - what it has to offer! I admire the author 'Jenifer' for writing an amazing book about awakening the kundalini. This book not only focuses about awakening the kundalini but also in spiritual enlightenment, enhancing your psychic powers, also teaches the secret of intuition, chakra healing, yoga, meditation practices, and many many more! I am in love with this book and I can't wait to start practicing the techniques that I will be able to learn on this audio book! I will be referencing this book a lot in the future! Not only did it breaks down what to expect with coming into Kundalini but it also offered you some real mantras and chants to assist you along the way. A must listen/read for all of those growing as a soul on this earth and who's looking for spiritual enlightenment. A very good start and beyond! Fantastic guided practice, immediate awakening of energy in all chakras and becomes stronger each additional time you listen, very uplifting and relaxing. Thank you to the author, it is clear, useful & powerful. I found this book easy to connect to and comprehend. I highly recommend this book to anyone looking forward to shedding light on awakening to kundalini. This book is a wonderful resource that is brief and direct yet packed with useful and important information. The author provides the listener or reader with essential information on a topic that continues to remain veiled within a labyrinth of partial truths. It helps me understand the life-changing dynamics of kundalini awakening. It is truly a powerful practice that I wouldn't miss! It's a book I'll come back time and time again! A smart book that has provided me with noticeably helpful background information on what kundalini is and how to really work. All instructions and recommendations are very detailed, clear, effective and helpful. I liked this audio book very much and I would recommend it for those in need of this type of information. It's a book I'll come back time and time again! The author’s profound experiences are enough for me to hear her out and start considering awakening my kundalini with the use and help of this book. This is quite an amazing spiritual meditation. Lots of absorbing details to start the practice and be transformed with the benefits it brings. Kundalini awakening is just one of the ways in which one can return to the divine. Doing so does not only bring great joy, it also enables access more of the energy that runs throughout creation and see more of reality as it really is. This audiobook really did well, the author provided everything that I need to know and oh yes I love each of the narrators' voice. Simply the Best better than all the rest. 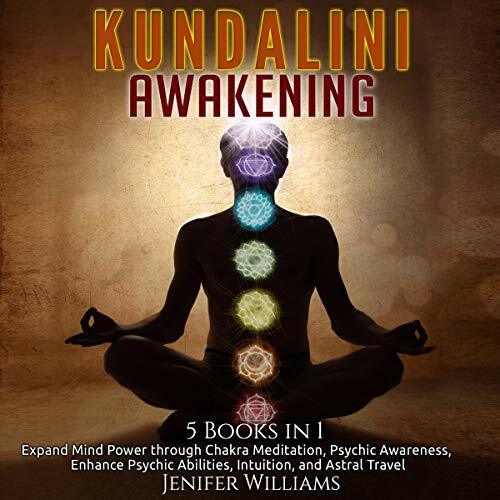 The author 'Jenifer Williams' provides/presents and or provides different techniques on how to awaken the kundalini. Tons of information about what kundalini is and other sub-related topics on awakening the kundalini. This is such a wonderful and very informative book indeed! A friend of mine recommended this audiobook, and I am so grateful. I've been searching for some kind of enlightenment in my life and understanding on kundalini, as well as, not being too complex for me to understand. This is a good book for beginners as it goes from basic into primitive and will definitely help you understand everything!